The second update for Radical Heights is now live, adding bike ramps, a new gadget, and more customisation options – including, most importantly, zebra pants and a new fanny pack. Check out our list of the best battle royale games around! Boss Key have brought in a total of 32 new cosmetic items, including new hairstyles and dances. There are also improvements to the customisation process as a whole – all dress-up options have been consolidated into the Prize Room, and characters can now be rotated so you can check out your avatar’s behind. The new gadget is the Scanner, which can be deployed to show the last location of enemies within a certain distance. 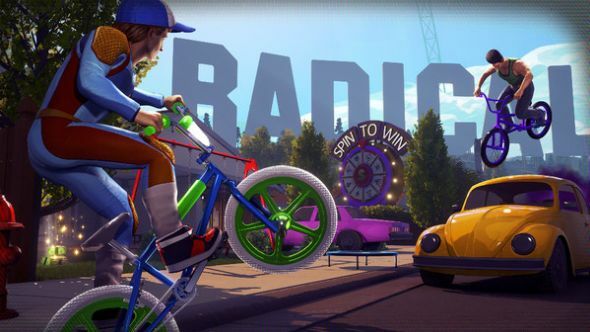 Finally, for a game so obsessed with BMX bike tricks it’s funny to think that there weren’t any regular bike ramps around the map – well, now there are, so you can show off your moves just before you get shot for being too exposed. You can read the full list of patch notes here. Boss Key have been posting updates pretty often, and they promise more soon – including more ADS options, ammo splitting, and major changes to Lustful Pines Playground.